After being eradicated from Ontario for over a decade, Rabies is back in the province as of late last year. Coventry Animal Hospital wants to ensure everyone has information on this deadly disease to keep your pets and family members safe. 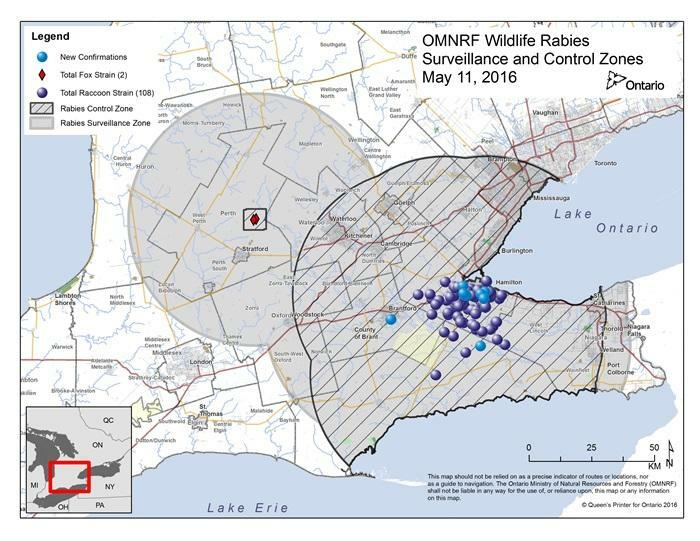 As of April 19th, 90 cases of raccoon variant Rabies have been found in the Hamilton area and 2 cases of fox variant Rabies have been found in Perth County. Rabies remains a serious public health concern. Rabies is caused by a bullet-shaped virus. It is relatively unstable in the environment and establishing infection requires direct contact with infected mucous membranes, like a bite wound. Only mammals are susceptible to infection and wildlife is the primary animal group where infection occurs. When wildlife come into contact with humans or domestic animals, Rabies becomes a public health problem. Rabies remains an important and nearly untreatable illness with deaths occurring every year. The virus in the infected animal’s saliva enters the victim’s tissues during the bite. The virus attaches to the local muscle cells for a couple of days before penetrating to local nerves and beginning its slow ascent to the brain. Once in nervous tissue, the virus is not accessible to the immune system and may safely proceed, although the journey is slow and can take up to a year. The virus ultimately reaches the brain and in two to three days is evident in all body secretions. At this point, the disease becomes transmissible and symptoms begin. Once symptoms begin, treatment is nearly impossible and death can occur within days. This is when a change in personality is noted. For example, friendly animals become shy. A voice change may also be noted. Classically, this is the “mad dog” stage. The animal has no fear. The animal may attack. Weakness or paralysis starts. The larynx is paralyzed, resulting in an inability to swallow and “foaming at the mouth” results. The intercostal muscles which control breathing become paralyzed. What if there is a bite incident? How do we test for Rabies? If a person is bitten by a dog or cat that is not vaccinated, the local health unit must be notified and the pet may be quarantined for a specific length of time. If a wild animal bites your pet, a confinement period also may be indicated. 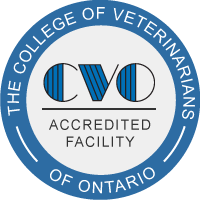 Every situation is different, so it is best to call your veterinarian and they can direct you to the best course of action. Definitive testing for Rabies must be done on the brain. There is no way to test for Rabies in a living animal. Classical symptoms of Rabies may not be obviously recognizable, making diagnosis very difficult. Long quarantines are often needed to determine if infection has occurred. Luckily, Rabies can be prevented with vaccination. In regards to spread of Rabies in wildlife, almost half a million oral Rabies vaccine baits have been distributed and the Ministry of Natural Resources and Forestry are continuing active surveillance of high risk areas. You can keep your pets and family safe by ensuring your pets are up to date with their Rabies vaccines. It is required by law for every dog and cat to be vaccinated against this deadly disease.